Laura Fisher Stoddard was born on November 2, 1898 in Clam Harbour. Her parents were Walter Edward Stoddard and Hannah Amelia Palmer. On November 16, 1932, Laura married Roy Young Sanford who was born November 11, 1898 in Avondale, Hants County. Walter Edward Stoddard was born February 1, 1852 in Clam Harbour and was the son of Thomas Stoddard (1817-1858) and Elizabeth Eisan. He married Hannah Palmer on January 22, 1878. Hannah was the daughter of Captain William Palmer and Susanna Margaret Marks. 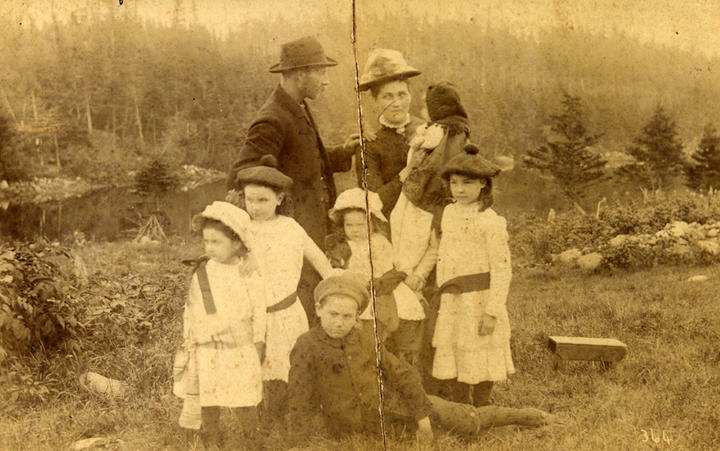 Together Walter and Hannah had eleven children: Seldon C. (1878), Beatrice L. (1881), Ada B. (1882), Gertrude (1884), Lola E. (1886), Ernest E. (1889), William P. (1890), Frank C. (1892), Florence E. (1894), Amy V. (1896), and Laura F. (1898). Walter worked as a fisherman, farmer, and was also the postmaster in Clam Harbour. He and his wife owned and operated a popular fifteen room hotel called the Stoddard House on the road to Clam Harbour beach. W. E. Stoddard was still running the hotel in 1930 and the rates were two dollars a day or twelve dollars per week. The hotel featured a veranda, electricity, tennis and croquet grounds, boating, surf bathing and swimming and was close to fishing and shore bird shooting areas as well as beautiful beaches. Laura and her husband Roy lived at the home of her parents and helped run the hotel and post office. Walter died February 4, 1945 and Hannah died suddenly on August 7, 1937. They are both buried in the Clam Harbour United Church cemetery. In 1946 the hotel was being operated by Mrs. R. Y. Sanford and featured eight bedrooms, a veranda, fresh vegetables, a nearby beach and sport fishing, electric lights, and indoor plumbing. Rates per day with board were two dollars and fifty cents or twelve dollars per week, and single rooms were one dollar per night. The hotel appears to have continued to operate until 1950, when the last entry was made in the hotel register (register has remained with the current owners of the building).Laura (Stoddard) Sanford passed away c. 1970 and Roy died in 1988. The records were left in the Stoddard family home at the time of its sale by Roy Sanford to Gordon and Charlotte (Wilson) Hammond. The records were later donated the records to the Eastern Shore Archives in January 2010. Fonds consists of correspondence written to Walter, Hannah, and Laura Stoddard as well as records related to churches and church societies and memorabilia related to the First World War that was found in the Stoddard Hotel. Fonds also contains financial records including insurance policies and tax receipts as well as post office records including ledgers of records of registered mail. Remaining records include permits, dance step instructions, quilt patterns, paintings by Harold Brownhill, a poem by Burns Marks, a label from E. Homan’s clam cannery, a brochure for a Camp Charlotte, a sign erected by the Cranberry Committee, and a business card and photograph of Judge F. M. Morson. Gordon and Charlotte (Wilson) Hammond. Photographs have been scanned into photo database. To minimize handling of originals, researchers are asked to view scanned photographs . Although the records were donated by Gordon Hammond in 2010, they were not accessioned until 2013 and for ease of storage, were accessioned as 2013.010 as opposed to a 2010 accession number. Bureau of Information and Publicity (1946). Where to stay in Nova Scotia 1946. 2003.81, Webber aisle, Folder 9, Box 1, Eastern Shore Archives, Lake Charlotte, NS. Department of Highways (1930). Where to stay in Nova Scotia 1930. 2005.019, Webber aisle, Folder 9, Box 1, Eastern Shore Archives, Lake Charlotte, NS. Stevens, Robert Kim (2000). Eastern Shore families: Clam Harbour including the localities of Owl’s Head Harbour, Little Harbour, Southwest Cove, DeBaie’s Cove, Clam Harbour, Clam Bay, Upper Lakeville, Lake Charlotte. Lake Charlotte: Maritime Imprints. [Well known Clam Harbour resident dies], Stoddard family clippings, Filing cabinet , Drawer , Eastern Shore Archives, Lake Charlotte, NS.